Temperature mapping, qualification, and validation are required for pharma segment for storage of any medicines. This is required as per international standards to ensure that the medicines are always stored and distributed within the prescribed temperature limits. The cold rooms for storage of medicines are normally between 2°C and 8°C. This is a very critical range for most of the medicines. Few hours above 2°C or few hours below 8°C will damage the stored medicines. The walk-in freezer for medicines are normally between -18°C and -22°C. However, there are different requirements up to -40°C. The storage rooms will be designed based on mechanical parameters to achieve these specified temperature ranges. However, by various operational parameters, it is possible that certain areas of the storage area are not maintaining the desired temperature range. One such factor is air flow. In a corner of the cold room where there is a higher air flow, it is possible that the temperature goes below 2°C. Also, it is possible that in a rack near the door, the temperature goes above 8°C. 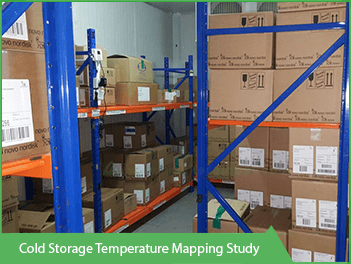 In order to understand the behavior of the entire storage area, it is essential to conduct a thermal mapping and validation process. Another term for this study is temperature qualification. The procedure of temperature mapping, qualification and validation are defined in a protocol, also called as SOP (standard Operating procedure). However, protocol and SOP are different. The protocol is only for carrying out the tests and the entire study. SOP is a procedure based on which you should be carrying out your daily operations. SOP is guidelines for the operators. As an example, after the validation procedure, we will indicate in the report the maximum door opening time should be 2 minutes and that duration between two door openings should be 10 minutes. In such case, you have to be defined this in the SOP so that all operators are aware of the same. We also prepare SOP for our customers after carrying out a successful validation of cold rooms and walk-in freezers. Installation Qualification (IQ) – These tests validate whether the installation are meeting the requirements. Operational qualification tests (OQ) – These consist of a series of tests to ascertain that the cold room or freezer operates as specified. Performance Qualification tests (PQ) – These series of tests consist of rigorous tests of performance under various practical conditions. 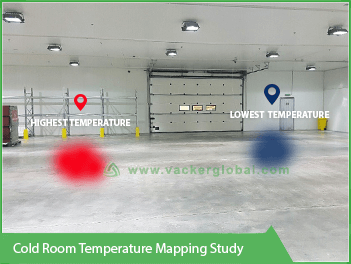 Vacker provides temperature mapping & qualification for cold rooms and walk-in freezers. We carry out the complete preparation of protocol and execution of tests up to the preparation of SOPs as required by the clients. In case the client requires control of humidity, we provide dehumidification of cold rooms. This includes design calculation for selecting right capacity of dehumidifiers of the cold rooms and installation of desiccant dehumidifiers. Based on the test reports, Vacker provides recommendations for best-operating practices for cold chain segments. After issue of the validation reports, Vacker also provides supply and installation of real time temperature monitoring systems for recording and generating alerts when required. During the temperature mapping and validation, we cover the following equipment as part of the study. Cooling system of the cold store and freezer. Independent compressors and evaporators of the cooling system. Control panels of the cooling system. Sensors and the temperature control system of the cooling units. Inspection of the lighting including suitability of the same. Inspection of the thermal insulated walls. Inspection of the shelves including the material used. Temperature and humidity data loggers for continuous recording of the data during the test processes. Infrared thermometer for measuring temperature at different instances. Measuring instruments for measuring size of the room. The cold room should always maintain the temperature range. If you require maintaining humidity, then the cold room should also maintain the desired humidity at all times. The temperature should recover fast after a door opening. In case of a power failure, the temperature should remain within the limits for sufficient time. If the temperature goes above or below the limits, there should be an alert system to inform the operating personnel. For critical medicines and in areas with the inconsistency of electric power, there should be a generator back up. 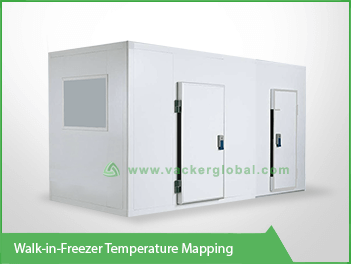 The mapping study of a cold room or freezer involves a series of tests. The chances of failure in one test will result in disqualification of the entire cold room. We will come to know about the failure after completing all the tests and upon downloading the entire data. This is much more time consuming than a much bigger warehouse. A warehouse involves only a couple of tests, whereas a cold room involves at least 10 different scenarios based on the type of cold room. If the cold room fails, it will result in a huge loss of time and money. IT is possible that after carrying out the rectifications, one of the other tests may fail. This is very much possible because the cold room or freezer involves multiple tests under different conditions. In order to assist the customers with these challenges, we provide wireless data loggers with real-time transmission of data. 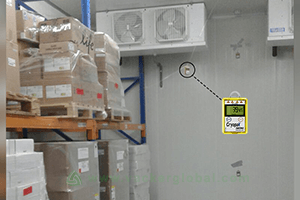 Depending on the size of the cold room or freezer, we provide either Bluetooth or radio frequency based monitoring systems. The number of data loggers, location etc. will be exactly the same as the conventional method. The data will be transmitted in real time to our software for the mapping study. There will be alerts generated through email or phone call in case of escalations. We will notify the customer about the same immediately and they can take corrective actions. Upon completion of the corrective action, we will repeat the tests. These are cloud based monitoring systems and hence we can monitor the data from our offices. Based on mutual agreement, we will remove the data loggers only if the test results are satisfactory.